The JCM facilitates diffusion of leading low carbon technologies, products, systems, services, and infrastructure as well as implementation of mitigation actions, and contributing to sustainable development of Laos. It appropriately evaluates contributions to GHG emission reductions or removals from Japan in a quantitative manner, by applying measurement, reporting and verification (MRV) methodologies, and uses them to achieve Japan’s emission reduction target. 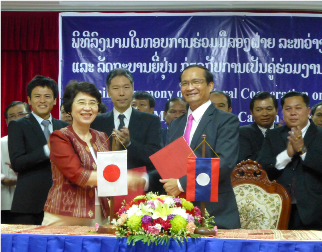 Laos and Japan signed a bilateral document for the introduction of the JCM on August 7th, 2013.